This no-knead bread is just incredible. This no-knead bread is so easy, anyone can make it, but it tastes like an artisan-crafted bread. This bread is almost sourdough-like in taste but has an airy texture that is quite frankly amazing. I have never made bread so good. Thanks to Jim Lahey, you too can make this bread. This recipe was developed by Jim Lahey from Sullivan Street Bakery in New York City. He was able to create a bread recipe that will have the most inexperienced bread breaker making some of the most delicious bread in their life. What makes this recipe so incredible? The very long rise—this bread may rise up to 18 hours. What does a long rise get you? This flavorful and tangy bread, with an incredible crust. 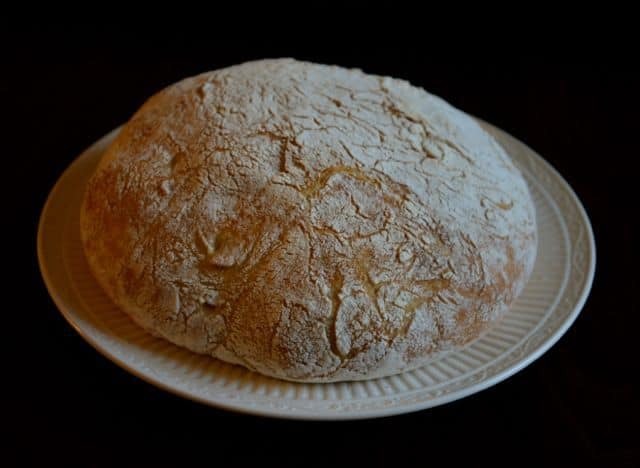 The cooking technique for this No Knead Bread is also unique. The bread is baked in a Dutch oven with the lid on for a portion of the baking time. What does this do? It helps to replicate the baking ovens in a bakery. In a bakery, some ovens inject steam into the oven while it is baking. Home ovens do not have such a feature. It is the steam that makes this bread incredible. So if you have never baked bread before, you can make this no-knead bread, and it isn’t difficult at all. There is no kneading, nothing complicated about this recipe at all. If you can measure, stir, and follow some very basic directions, you are going to have some of the most delicious bread you have ever had in your life. If you are a more experienced baker, be aware that the dough is going to be spongy, and very sticky, and you can leave it alone. This recipe has just four ingredients: flour, salt, yeast, and water. You use just a tiny amount of yeast. I use SAF brand because I like the way it tastes. I also used King Arthur flour because I love the density of any baked good when you use this flour. What I love about this recipe is that there is nothing artificial. I also like that it tastes like a hint of sourdough bread without having to keep that culture alive—I have always had the worst luck when trying to keep a sourdough bread culture going. So without any more of my blathering, let’s get down to some delicious bread baking. Please note, the cooking time is not listed correctly in the recipe. It will take at a minimum 14 and 15 hours to rise, and at least 45 minutes to bake. Do you love whole wheat bread? Be sure to check out my amazing 100% whole wheat bread. This No Knead Bread is the closest thing to homemade sourdough bread you will get without a sourdough starter. In a large bowl combine the flour, salt, yeast, and water. Stir this bread dough until it is well mixed. It will look “shaggy” and will not have a uniform texture. Cover with plastic wrap and allow to rise for 12 to 14 hours in a room that is at least 70 degrees F.
Turn dough onto a floured surface. Add just enough flour to keep the dough from sticking to your hands. Quickly shape into a ball and fold over one or twice, cover with plastic wrap, and let rest for 15 minutes. Sprinkle a clean kitchen towel with cornmeal, wheat bran, or flour and turn dough onto it, placing the seam side down on the towel. Sprinkle the top of the dough with additional cornmeal/wheat bran/flour and cover with another clean towel. Let rise for an additional 2 hours or until the dough does not spring back when poked. Place a heavy covered pot, such as a Dutch oven, in the oven and preheat the oven to 450 degrees F. Heat the pot for at least 30 minutes. Remove the pot from the oven and uncover it. Remove the top towel from the dough. Carefully slide your hand under the towel underneath the dough, and flip the dough over into the pot. The seam side should now be facing up. Place the lid back on the pot, and place into the oven. Bake for 30 minutes. Remove the pot lid and bake an additional 15 to 30 minutes, until the bread is beautifully brown. Cool the bread on a cooling rack before slicing. I used my 5.5 quart sized pot. Can I add a sourdough starter to it? I don’t know, I haven’t tried this. This does have a milk sour dough flavor. I think if you added a full starter and waited the same amount of time, you may have bread dough every where while it is rising. Would truly love it IF you put the recipe on here in long form,…under the picture. I am charged for watching things via u-tube.OR maybe direct me to a site where I would find it already writen out. Thank you. I am sorry it came off the page for no apparently reason. I have added the recipe back. What is the equivalent for instant dry yeast? I stick with the 1/4 teaspoon. i am sure that will work well. You need to use a pot with a lid. Can you do this w/ whole wheat flour? It is not recommended to do this with whole wheat flour. This is an America’s Test Kitchen recipe. Look it up. I’ve been making it for years. This one leaves out the beer. Try it the ATK way…suggest using a German wheat beer. Hmmm, well this version is Jim Lahey. Maybe American Test Kitchen made the recipe with beer. I really liked your suggestions. I am going to give some of your suggestions a try. Thank you so much for sharing your link. What type of flour? Also the yeast, is it rapid rise or regular? Any type of flour, preferably bread, but All purpose is fine. Any type of yeast will work, rapid rise doesn’t have much meaning when it has a 14 hour rise time. I used SAF brand. I will be posting a video on this next week. I use rapid rise yeast. If you use regular active dry yeast, dissolve it in the water for 5 minutes before adding it to the flour. I use a combination of bread flour and all purpose unbleached flour. You can use all of one type or the other. It’s fun to experiment with different types. Whole wheat flour–in any amount– won’t work with this recipe. Gluten will not form and the bread will not rise.